Lady Jane Grey was born in either 1836 or 1837, the daughter of Henry Grey and Lady Frances Brandon. 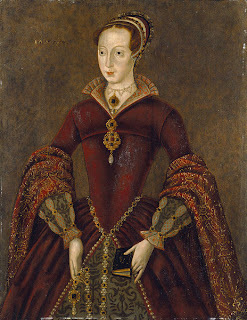 Jane Grey was the granddaughter of Mary Tudor, whose father was Henry Tudor and whose brother was Henry VIII. Jane Grey, through the influence of her father, became a committed Protestant. In 1547, Jane went to live with live in the household of Thomas Seymour, who married Catherine Parr, the widow of Henry VIII. Jane lived with the couple until Catherine Parr died in 1848. Though Jane, for a time, was considered to marry King Edward VI, who was the same age as her, the idea was scrapped, and Grey married Lord Guildford Dudley. In 1553, Edward VI was dying at the age of fifteen due to sickness. On his deathbed, Edward named his Protestant cousin, Jane Grey, his successor so he could keep the throne from his Catholic half-sister, Mary. This was possibly due to persuasion from John Dudley, the Duke of Northumberland, Jane Grey's father-in-law. The King died on July 6th, 1553, and on July 9th, Jane was informed that she was queen. She reportedly claimed the crown reluctantly and refused to name her husband as king. John Dudley had kept Mary Tudor isolated to keep her from gathering support, but when Mary heard that Edward was dead, she began gathering followers, and on July 19th, the Privy Council switch allegiance from Jane to Mary. Mary returned to London on August 3rd and Dudley was executed on the 22nd of August, 1553. Jane and her husband, Guildford Dudley, were charged for high treason, and was found guilty. Though her execution was scheduled for February 9th, 1554, it was postponed to giver her a chance to convert to the Catholic faith, which she did not do. After her husband was beheaded, Jane was brought out. She recited Psalm 51, then prepared for her death. The executioner asked her forgivness, which she granted, asking "I pray you dispatch me quickly." She was beheaded, and her final words are recorded to have been "Lord, into thy hands I commend my spirit." Lady Jane Grey is on our list because she, though for only a short time, uprooted the Tudor line from the throne of England. She is also on our list because she has gone down in history as the nine-day queen, for that is how many days she truly had to rule.